Dental implants are the most successful form of treatment available for the replacement of missing teeth. Offering you teeth that look, feel and function like natural teeth. Loose and uncomfortable dentures can now be replaced with something that is permanent and feels like part of you. 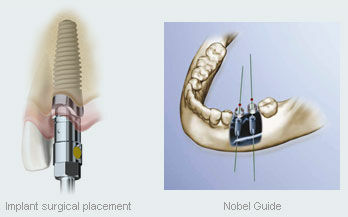 Implants are surgical-grade titanium fixtures placed into the jawbone as a substitute for a missing tooth root. They are allowed to integrate naturally with the bone (a process called osseointegration) before a crown, bridge or fixed denture is fitted to replace one or more missing teeth, thus eliminating the need for uncomfortable or ill-fitting dentures. Dental implants may be needed for a variety of reasons including trauma, decay or gum disease. Missing teeth can cause the lips and face to collapse, giving a premature aged appearance, as the bony structure that was once supporting a tooth or teeth deteriorates.